Nothing less than a top 10 finish in the Premier League will suffice for Burnley’s midfield maestro Steven Defour. The Belgium international may be sidelined for much of the remainder of the campaign but the 29-year-old is still urging his team mates to finish the season strongly. 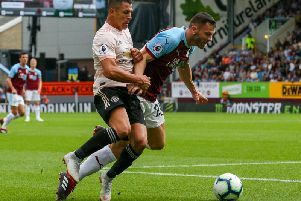 Burnley flirted with the Champions League places for a spell, climbing to fourth in the top flight with victory over Stoke City in mid-December. However, they haven’t won since. “We’re still doing well but we could have done better. It’s just those fine details,” said Defour. “If you look at where we came from last year we also had a spell in January/February where we didn’t get a win for a while. They’re strange games sometimes where one decision or one goal makes the difference. “I would prefer to be in our position than half of the other teams. Every team in the Premier League has a spell where it’s not working for them and this has been our spell. We just have to get winning again really quickly. “We need top 10 now, that’s my honest opinion. We just need to keep working to try and stay in the top 10 and that will be a nice evolution from last year.